2017 was an interesting year for us. It was full of ups and downs. We had some absolutely amazing moments, but overall it was a pretty difficult year. I know we can’t complain because others around the world went through some major tragedies—from hurricanes and natural disasters, to horrible acts of violence, political turmoil, and more. We are certainly blessed that we didn’t encounter any major trauma in our personal lives, but it still doesn’t change that fact that 2017 was far from our best year yet. One of the major reasons for this was the lack of stability throughout the year. Literally every single plan we made during the year was complicated by a schedule change for a last-minute video project. We are used to this as it’s the nature of freelance photo and video work, but at the same time, it ended up causing lots of unnecessary stress in both our business and personal lives. But, instead of complaining and focusing on the negatives, we want to start 2018 off right by sharing some of our favorite moments from the past year. Even though we were traveling only a fraction of the time compared to previous years, we still only managed to sleep in our own beds around 50% of the year for me and 60% of the year for Micah. Being home for half the year made me feel like I was on house arrest, but thankfully, when I broke out of our tiny apartment walls, we managed to have plenty of great experiences. We took road trips to New Mexico, New Orleans, North Dakota, Illinois, Ohio, and Canada, we ventured to Alaska, Tennessee, Taiwan and Ecuador, and we spent plenty of time exploring our home state of Minnesota. Our first road trip of 2017 was heading north to Lutsen Mountain to go skiing for Micah’s birthday. We spent a couple of nights at the “ski-in, ski-out” lodge and had a lot of fun hiking, skiing, and listening to music at the pub. The only downfall was that we were greeted with a brisk temperature of -8ºF and a wind chill, aka feels like temperature, around -30ºF. Regardless, we piled on all of our layers and set out for a day of skiing. Thankfully, the one plus was there weren’t too many others skiing that day, so we practically had the place to ourselves. We are used to skiing in bitterly cold conditions, but this was an entirely different level and my fingers were frozen and numb before we even got off the short chairlift. It was cold, but still fun and definitely a memorable way to start out our year! During our winter trip to Alaska, we based ourselves in Anchorage for all but one night. We decided to head down to Homer to spend the night in a cozy cabin just outside of town. One of our favorite adventures from this little side trip was taking a sightseeing plane ride over the glaciers. We flew over Kachemak Bay and the surrounding glaciers on a 45 minute tour of the area. Our small four seater plane was a bit bumpy at times, but that only added to the excitement. We were stunned by the views outside our windows and vowed to return to this area again sometime in the summer. This one is kind of a long story, so I’ll try to make it short. Before our trip, Micah had been watching the reality TV show, Alaska the Last Frontier. He was intrigued by the Kilcher family and had been chatting with one of the cast members (Atz Lee) on Instagram. When we decided to visit Homer (where the show is filmed), he was curious if they did tours of the family farm. While tours of the farm are offered, they aren’t operating during the winter season. Atz Lee told Micah he was welcome to head out to the farm for a look around. So, when we arrived, we decided to head out in that direction to see what we would find. What we found was a long, narrow driveway with deep snow on each side. We thought about turning around because we didn’t want to be intrusive, but then a couple of trucks pulled up behind us, so the only way to go was forward. Well…we ended up driving right up behind the crew filming a scene for the new season of the show. We had to keep driving closer and closer to the set to find a spot to turn around. The worst part was because the snow was so deep, Micah had to make a 10-point U-turn just to get us out of there. After we slowly inched our way to position our truck in the opposite direction, the crew members then had to move their cars so we could get out from behind them. We felt so embarrassed barging onto the set, but it gave us quite the laugh after we got over the initial shock! The funniest part of it all was when we got back to the cabin later that night, and Atz Lee told Micah that we should have gotten out of the truck to say hi…face palm’s all around. Sometimes the simplest events are the most memorable. And that’s exactly what this moment was. We were in Anchorage, Alaska, and I read about Beartooth Theater Pub & Grill. What is so special about a movie theater you might wonder? Do you know about those fancy movie theaters that have reclining seats, blankets, and servers? Well, Beartooth is basically a chilled-out version of those fancier movie theaters. They show second-run movies, as well as documentaries, Art House films, and concerts. The theater has a cozy, homey feel, the movies are cheap (starting at $4 per person) and the food and drinks are delicious. The seats are standard movie theater seats, and every other row of seats have been removed and replaced with a table. You order your food and drinks before taking your seat and you are served towards the beginning of the movie. It’s pretty much the perfect way to spend the evening when you need a break from the chilly Alaska winter. On our last day in Anchorage, our flight was set to leave at 6:00 a.m. So, rather than getting any sleep, we decided to pull an all nighter and search for northern lights instead. Even though the northern light forecast was promising during our visit, our entire week in Anchorage had been plagued with clouds. Luckily, that last night/morning of our trip, the clouds cleared and we had one last chance to spot the northern lights. On our drive out of town, I spotted the first glimpse of the lights and I could hardly contain my excitement. Once we found a good parking spot next to the waters of the Turnagain Arm, we caught a spectacular showing of the aurora borealis. We spent the next several hours in awe before we had to peel ourselves away for our return flight home. I don’t think I could come up with a better way to end the trip if I tried! One of our favorite adventures in the Galapagos Islands was hiking the Sierra Negra Volcano on Isabela Island. We lucked out with cloudy skies during our hike—it made the heat much more bearable during our six hours hike. When we reached the top, we were welcomed with views overlooking the 2nd largest caldera in the world. Pablo, our naturalist guide, told us stories about when he watched the latest eruption in 2005. It was fascinating to see the destruction created by the volcano and the subsequent regrowth, and we loved exploring this land based adventure in the Galapagos Islands. One of the main activities during our land based tour through the Galapagos Islands with Galakiwi was stand up paddle boarding. Micah and I always love going out for a SUP adventure, and we both had a different favorite paddleboard moment from the trip. My favorite SUP moment happened on our first full day in the Galapagos Islands. During our first paddling adventure, we took a break and all of a sudden sea lions were splashing and playing in the water surrounding us. They are so adorable to watch, and even more so when they are right up next to you! Micah’s favorite moment was when we were on Floreana Island and paddling at sunset. I called it an early night, but Micah had a blast trying his hand at SUP surfing. He and a few others spent the remaining moments of sunlight out on the water during a spectacular sunset. We swam with many sharks while snorkeling in the Galapagos Islands, but two instances stand out most. One was when we were snorkeling at Kicker Rock off the coast of San Cristobal Island. As we were swimming, someone spotted hammerhead sharks lurking below. Micah and I saw the outline of the hammerheads, but a few others were able to free dive deeper to get a really good look at them. It was definitely exhilarating to be so close to several hammerhead sharks! The next instance was when we were snorkeling off the coast of Isabela Island. There were quite a few white and black tipped reef sharks swimming around, but the real excitement was when we found a cave of well over 30 sharks just hanging out and relaxing. We all took turns diving down to get a peek into the cave—it was so cool to see a cave filled with sharks and it remains a standout memory from our time on the islands. Saved by the Bell was one of my favorite TV shows growing up, so when I found out about the Saved by the Max pop-up restaurant in Chicago, I knew we had to go. Chicago is a six hour drive from our home base in Minnesota, so a road trip was definitely in order. We finally had a chance to make the trip to Chicago the beginning of May, and it happened to be just in time as the pop-up restaurant packed up and moved to another location (Los Angeles) the end of May. We had such a fun evening pretending to hang out with Zach, Kelly and the rest of the crew, and the food was pretty decent, as well! We took about a million photos by the pay phone and the lockers. And, I may or may not have sung along to the endless soundtrack of Saved by the Bell songs playing in the background. While we had quite a few memorable moments in New Mexico, the two that stand out the most were the two most unexpected adventures we had. While we loved exploring the White Sands National Monument, the Kasha-Katuwe Tent Rocks National Monument caught us completely by surprise. We arrived a couple of hours before the park closed for the evening and we were just expecting to hike a short trail. Well, the further we hiked, the more we became entranced and we ended up hiking all the way to the end of the Slot Canyon Trail. The hike was only three miles roundtrip, but the views were simply stunning. From the chimney rocks to the slot canyons, we couldn’t stop exclaiming how unexpected and beautiful the hike was, and it quickly became one of our favorite short hikes ever. The other completely unexpected event in New Mexico was our visit to Meow Wolf. I had read a bit about this immersive art installation and we went into the experience not really knowing what to expect. What we found was a crazy, eerie world that left our heads spinning. The only way we can describe it is the Upside Down parallel universe from Stranger Things mixed with a hands on science museum/art gallery. You start off by walking into a recreation of an old house—the house is filled with clues about what had happened there in the past. As you explore both the house and the story, you will be sucked into another dimension full of wacky and mind-boggling displays. What looks like an ordinary house is anything but—you can walk through fireplaces, a fridge, closets and more and what you find on the other side is anything but normal. You really just have to see it to believe it, and you have to see it. Trust us. Coffee is one of our favorite drinks to sip on—we’ve taken several coffee tours in the past and are always up for checking out a new coffee shop. When we made our way to Columbus, Ohio, this past summer, we were excited when we learned about the Columbus Coffee Trail. The coffee trail is not a guided tour, but rather a group of high quality coffee shops that are organized together to create a trail of coffee shops throughout the city. You can grab a passport book and make your way to all the coffee shops included in the booklet. Each time you visit a new shop, be sure to get your booklet stamped at checkout. When you have four stamps in your passport book, you can turn it in to the tourism board for a free t-shirt. Not only did we enjoy stopping in several coffee shops during our time in Columbus, we also love our coffee t-shirts! It was such a fun way to explore some of the best coffee shops in town. Our summer road trip to Canada was changed way too many times due to shifts in our work schedule. What was supposed to be a trip to Banff National and Jasper National Park, ended up turning into a trip much closer to home. We were short on time, so we made our way straight north from Minneapolis to Ontario and explored a couple of Provincial Parks instead. Our visit was a rainy one indeed, but in-between museum visits and coffee shops, we managed to go out for a couple of hikes at Neys Provincial Park and Sleeping Giant Provincial Park. We absolutely loved the landscapes of our sunset hike at Neys Provincial Park, and the views from the Thunder Bay Lookout at Sleeping Giant Provincial Park were top notch! It may have not been the road trip we were originally planning, but it definitely opened our eyes to another region of Canada that we need to spend more time exploring. After another cancelled trip plagued our year, we ended up heading out on another road trip. This time, we made our way to New Orleans, Louisiana. I had been wanting to visit this city for years, but Micah had been a couple of times already. Thankfully, he humored me and agreed to make a third visit to The Big Easy, so we were off to spend Halloween week in one of the most haunted cities in the USA. While we enjoyed plenty of spooky activities and dined on some delicious food, the one activity that stood out to us most was our Tuesday night visit to Maple Leaf Bar. We had heard rumors about an amazing band called Rebirth Jazz Band, and we just had to see it for ourselves. The place was packed, and I can see why—these guys were amazing. The energy and skill up on stage was mesmerizing and we were so glad we made the effort to see them. It was worth it 100 times over and we will definitely be back next time we are in New Orleans on a Tuesday night! We had a 24 hour layover in Vancouver, Canada, on our way to Taiwan, and our visit coincided perfectly with the opening of the Canyon Lights event at Capilano Suspension Bridge Park. I had been wanting to visit this park for quite some time, especially during the lights event, so I was overjoyed at the timing of our visit. We spent the evening crossing suspension bridges above canyons and high in the trees, and the twinkling lights were pure magic. The atmosphere of the park during this event is stunning and we felt like we had entered a fairy tale. The combination of adrenaline from the height of the bridges and walkways, mixed with the holiday spirit was a unique pairing and one that we thoroughly enjoyed. This was another one of those simple moments that just made everything feel right in the world. We were in Taipei and had made reservations for a popular hot pot restaurant called Wu Lao Guo Elixir Health Pot Taipei. I wasn’t feeling the best that evening, and we were debating on whether or not to skip out on our reservation for some downtime at the hotel. Well, FOMO won out and before we knew it, we were sitting in our secluded booth with a steaming hot pot in front of us. We ordered both types of broth (regular and spicy) with beef and sweet potatoes, and I can’t get over how delicious everything was. The spicy broth wasn’t actually all that spicy, but the flavor was robust, and the regular broth was rich and milky. We took our time soaking up the atmosphere and stuffing ourselves silly, and the palate cleanser they served at the end of the meal was a refreshing way to end the evening. The Maokong Gondola in Taipei, Taiwan, transports passengers from the Taipei Zoo to Maokong, which is a popular tea growing region in the city. We opted for a gondola ride in a Crystal Cabin, aka a cabin with a glass floor! The views from the gondola were fantastic—from observing the trees below us, to views of the sprawling city, we could barely pull ourselves away from the windows. After taking the gondola to the final stop, we disembarked and made our way to a traditional teahouse. There are plenty of teahouses to pick from, but we made our way to Yao Yue Teahouse. This spot was about a 30 minute walk from the station, and the views we found along the trails and at the teahouse made the trek worth it. We sat outside and followed the instructions for brewing a pot of delicious tea. Our weekday visit was quiet and relaxing, and made for a great escape from the hustle and bustle of the city. We hope that you had many wonderful moments in 2017 and even more to come in 2018. We’d love to hear some of your favorite moments from the past year, so share away in the comments below and Happy New Year! What a year! Being with those sharks sounds like so much fun. As for me, fun trips in Qatar and Myanmar as well as a trip to our beloved Thailand, with about 20 NYC house sits stuffed in there. Good times! Yeah, swimming with the sharks was super cool! We had a blast! Those all sound like amazing trips–would love to go to all those spots–we are hoping to make it to Thailand finally this year! Looks perfect! Great memories! and great ideas for our own next trips! I want to go to Alaska! 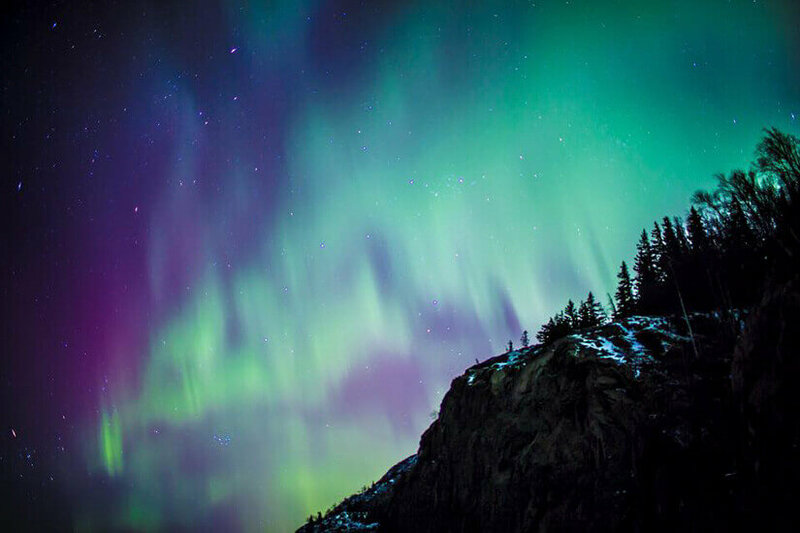 I want to see the Northern lights! Thanks for sharing the beauty, always! Quite an exciting year for you, guys! Many exotic destinations and exciting activities. We skied once in freezing temperatures in Colorado and it wasn’t fun, so I can sympathize with you about that. How exciting to see Capilano Bridge at night. It must have been a little scary, wasn’t it? I loved Vancouver and I’d return there at any time. Yeah, the bridge was a bit scary and high, lol! It was a lot of fun though–really cool to see it all lit up! And yeah skiing in freezing temperatures isn’t always the best, ha! Still fun though at least! You have had an amzing journey in 2017. I was freezing seeing the pics of Alaska and Lutsen Mountain. You were lucky the clouds cleared up right in time for those amazing northern lights. Thanks for that tip on passport book for coffee. ???? Lol, yeah those were both pretty cold experiences! We were so excited that the clouds cleared up–we were so happy to finally catch the lights! What a year indeed! I love that you got to see the Northern Lights and explore Alaska. And the animal encounters and hiking in the Galapogos looks so beautiful and memorable. And Saved By The Bell….oh, how I loved that show! Thanks for sharing your favourite moments! Here’s to 2018! Haha, yeah Saved By the Bell was the best, wasn’t it?! 🙂 The northern lights and Galapagos were definitely at the top of the list! Happy travels and 2018 to you, too! What an eventful year! It sounds like you explored a lot of different places and experiences. I was particularly drawn to your encounters with nature in the Galapagos and flying over the glaciers in Alaska. You are very lucky to live in a country that has such varied landscapes that you can access. Thanks! Yeah we loved the different landscapes we were able to see this past year. There are definitely a lot of great ones to explore. The Galapagos was amazing too–definitely one of the top highlights of the year! You had me at drink a bunch of great coffee and get a free t-shirt, the best kind of t-shirt. What an amazing year you guys have had and an inspiration to make travel happen by any means possible. Haha, yeah drinking coffee and getting a free t-shirt was pretty awesome!! 🙂 We loved it! I did Tent Rocks and Meow Wolf the same day when I was in New Mexico back in October and loved it. I went to a bunch of parks in the area and did a lot of hiking, but Tent Rocks was probably my favorite. The view from the top was beautiful and it was just such a gorgeous place to explore. And Meow Wolf is definitely it’s own universe of weird. That sounds like an awesome day! Both spots are so fun. I can see why Tent Rocks was probably your favorite–we loved it there. We didn’t get to do any other hiking in the area, but I hope we can check out some more trails on our next visit! You had some seriously amazing experiences in 2017. I’m super jealous of your Northern Lights experience. Plus, I’ve never, ever heard of Kasha-Katuwe Tent Rocks National Monument, but my husband and I are planning to drive to the Grand Canyon in a few weeks and you nest believe we’ll be making a stop there. Thanks for that inspiration! Yeah, we hadn’t heard of tent rocks either until we were in the area, but we were so glad we went! Hope you have a great time at the Grand Canyon and Tent Rocks too! It looks like you had an amazing time in Alaska. I wish I had had time to visit Homer when I was there in September but alas I didn’t. Did you get to see Denali while you were there? I saw her four time in five days. No, we didn’t get to see Denali. I was hoping we would have time to get there, but we didn’t unfortunately. That’s so lucky you got to see her four times! Would love to get there on our next visit! Alaska and Galapagos take the prize for being the most incredible destinations you’ve visited in 2017, in my opinion. That picture flying over the glaciers in Alaska is incredible! Both these destinations are at the top of my list, if only I didn’t live so far! They’re such exotic places, I wanted to be able to spend enough time when I go. Yeah, they were both pretty amazing–hope you can check them out sometime! I know what you mean about wanting to spend enough time there–have to make it worth the trip for sure! 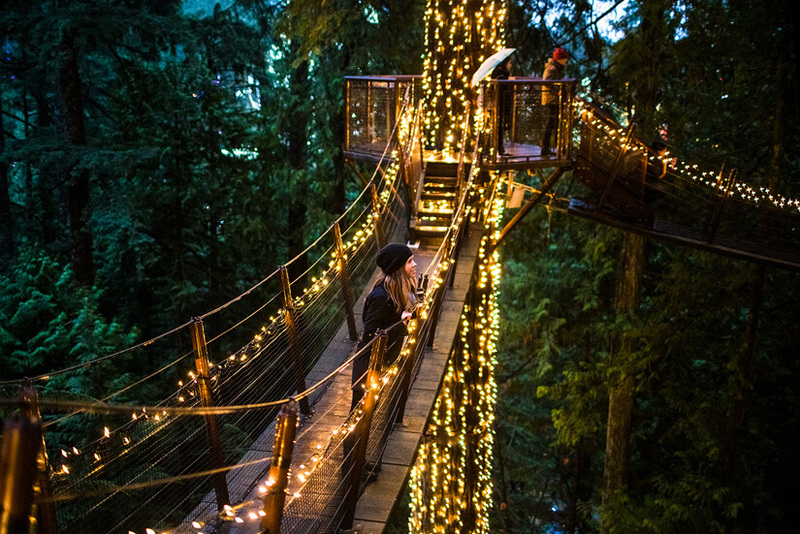 The Capilano Suspension Bridge looks so pretty with the lights on! I need to look into the Canyon Lights Event the next time I’m in Vancouver. Glad you liked the hotpot from my home country, Taiwan. It is one of the things I miss the most! I can see why you would miss it! I am missing it already, too, lol! And yeah, the Canyon Lights event is definitely worth a look if you are in town during that timeframe! Thanks! It was a great year for sure! Happy 2018 to you and happy travels! Thanks so much! It was a wonderful year. That’s awesome you are looking at planning a trip to the Galapagos–hope you have a great time and an awesome 2018! What a wonderful year you have enjoyed. I wish I could do half of that, A little envious, but very pleasing to read of your travels. Sharon recently posted…Looking for gift ideas for the Scuba Diving enthusiast in your life? Thanks, Sharon–it was a great year and we had a blast! Happy travels! Your travels and photos were amazing. Cheers for more of amazing travel moments for 2018! Thanks, Jake! Happy travels to you too! Surely you had a nice year with so much traveling. It was a great concept for writing “17 moments for 2017”. Hopefully we will get a updated post of 18 great moments for 2018, right? I also enjoyed so much reading this article. Thanks for sharing those nice pictures…. Thanks, Jon–it was a great year! Hope yours was too 🙂 We are definitely planning on sharing an update for 2018, so stay tuned! Waoo such a wonderful experience you have done in 2017. I wish I was flying over the glaciers of Alaska! By the way, the article made my day. Thanks! Hope you can make it to Alaska sometime too! I really liked your traveling images and experience with us. Especially the pictures you took in Alaska, Galapagos and Bridge Park in Vancouver is just outstanding!! Thanks so much–it was a great year for sure! Your 2017 travel memories really amazed me.. I like your every travel moments you have shared. but Hiking the Sierra Negra Volcano in the Galapagos really gorgeous. I wish I could go there for vacation though I pretty much busy so I think traveling is not for me. your traveling experience is really amazing. Thanks for sharing. Thanks, Rebecca! It was a great year for sure. Hope you can check out the Galapagos sometime–really great spot to explore! What a year it’d been for you guys. You’re lucky that you got a chance to explore Alaska, I have a dream to go there since my childhood and explore things out there. I’ve been to some of the amazing places in Asian countries and my best traveling experience is Langtang Trek in Nepal. Thank you for sharing your amazing experiences. Yeah it was a great year–thanks!